The header image on our website will proudly honor Memorial Day all month to remind us of the value of what we have lost. Posting this on our website was not done in haste because of the personal nature it represents to our family. The following is a brief story of a family being touched by an event that happened more than 50 years after the fact. However, we all need to be reminded that Memorial Day means different things to different people but should mean something to everyone. Memorial Day to the Barger’s can be described below by sharing one of our family stories with your family. Tommie came from a large family and was the younger brother to my (Eric Barger) late grandmother, Mary Barger (co-founder of Barger & Sons, Inc.). I didn’t know Tommie existed until several months before my wife and I were headed to France in 2005. My uncle Rickey mentioned grandma Mary’s brother was killed in World War II and was buried in Europe, at least that was the story. This story was enough to start me and the family looking up Tommie’s name to find out more about his journey. 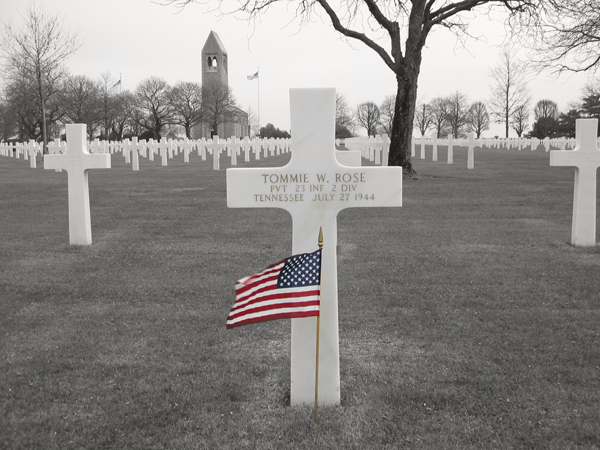 The more we researched, the more we found out about Uncle Tommie and found that he was buried in France. My grandma Mary was still alive at this time, and she only knew bits and pieces from the events because she was experiencing the onset of Alzheimer's disease. Her sisters and brother who were still living at this time knew more about Tommie’s departure than the details of his death or burial place. 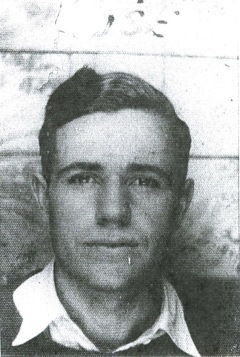 Believe this or not, no one knew exactly where he was buried, and no one from the family had ever had the opportunity to travel to France and visit the site. At the time of Tommie's death, grief and denial would be the two biggest emotions experienced by his family. Traveling overseas was expensive and a luxury our family could not afford. When all this came together for me, it was a sure sign my wife and I had to make the trip to see Uncle Tommie's gravesite while visiting France. The day came during our trip to France to make the five hour journey, one way, to the cemetery. Once we arrived at the cemetery we walked in the office and met the Superintendent, Gerald V. Arseneault, and the assistant superintendent, Alex Mora. Alex returned all of my emails, and spoke with me on the phone to make arrangements for my visit. Both Mr. Arseneult and Mr. Mora are both American veterans and are employed as Civil Servants in charge of the upkeep of the grounds. We spoke for a few minutes and then headed out to the graveside of Uncle Tommie Rose. Mr. Arseneault personally escorted us out to the site, talked with us about Tommie's division and the history of the cemetery. 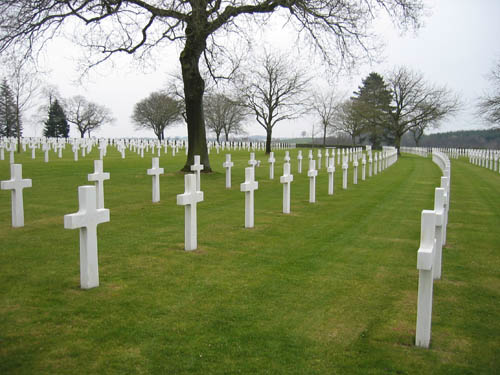 In 1947, the U.S. Military sent out letters to each dead soldier's next-of-kin asking if they wanted the body to be sent back to the states or buried permanently in France. As the responses came back, each body was either sent back to the United States or given a full military funeral with a priest of the same faith leading the service. The same American Flag used to cover the casket was then sent to the closest family member. This may have been Tommie’s oldest brother or wife, Opal Branham. We are not sure because the family lost contact with Opal after the war. Many people have asked why the name stands out on some grave site markers and not on others. This is an easily answered question that I often wondered about myself. Mr. Arseneault took sand from Omaha Beach, added just enough water to make the sand moist, and worked it into the face of the white Latin cross so the sand would remain inside the engraved letters on the cross. He then placed an American flag in front of the cross and told us we could take it with us. As we finished up, I went back and retrieved the flag. It was a very personal and touching experience. Mr. Arseneault explained to us that we could walk the grounds, tour inside the chapel, and tour the main office until we were ready to leave. We told him we would be ready to go no earlier than 1:30 pm (it was 11 am when we arrived) and would let him know. After Mr. Arseneault left us, Kelly and I stood around Tommie's grave overwhelmed by the sheer number of crosses in the cemetery. We then took some photographs, collected some of the excess sand used to highlight Tommie's marker, walked the grounds, and went inside the chapel. At 1 pm Mr. Arseneault met us and took us up in the tower of the chapel. He showed us the $70,000 automated system (donated by a Chicago company) that played the bell chimes and let us gaze around the top for a magnificent view. Another nice favor Mr. Arseneault did for Kelly and I, was to keep all maintenance and ground crews off the grounds while we visited. Clearing off 10 employees that work every day to keep the cemetery looking just the way it was when it was completed in 1956 was an extremely nice and thoughtful gesture that has not been forgotten. This was extremely nice of him to do and was greatly appreciated. We then returned to the bottom floor and he told me a little more about Tommie's division and what was going on around the time of his death. Kelly and I met back up with Mr. Arseneault in the main office where he gave me a Next-Of-Kin folder on Tommie and the cemetery. 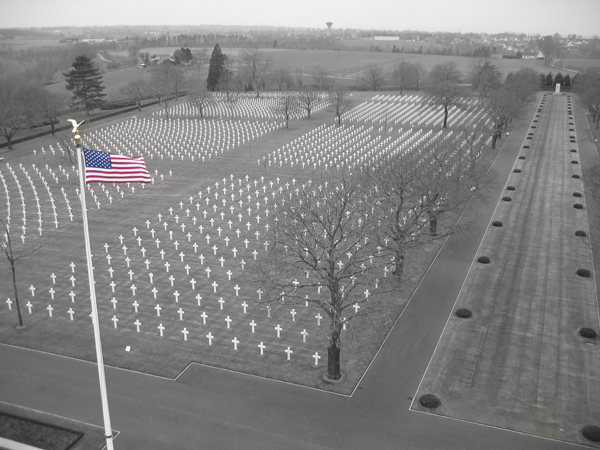 Our experience at the Brittany American Cemetery in St. James was truly a remarkable experience that puts life in perspective. The grounds were immaculate and were flawless in every sense of the word. Every penny used to fund the American Battle Monuments Commission, who oversees all military cemeteries, is worth the expense. A person cannot express the feelings at such a sacred place, making it very hard to convey those feelings to others. I never knew of my great Uncle Tommie until just prior to our trip, but any soldier that has given the ultimate sacrifice for his country is a hero. It was heart wrenching to look around and see 4,410 white marble Latin crosses and Jewish stars representing the lives that were ended prematurely for the cause of freedom. Witnessing such a sacred place is a memory that will stay with you for the rest of your life. Coming home and delivering a photograph of Uncle Tommie’s gravesite to his living brother and sisters was an end to another story. Losing a brother or sister is unimaginable to me, but real to many. Each of them seemed very grateful and emotional. It was like handing them a photograph was bringing their baby brother back home. I am glad that they were able to look at where Tommie rests on this earth and know that it was a beautiful place, a sacred place. A place where the American Flag flies proudly in a town that respects what the soldiers in the cemetery died for. Never forget that every soldier is a person defending your freedom. Behind every soldier is a family that loves them. As a country, we need to respect the fallen, the families, those on active duty, and the veterans.